An abandoned Etruscan city in the fields of the Maremma. Because the Etruscans are super cool! They were the smart people on the block- until the Romans came along and came, saw and conquered them. And this being Italy, you get some medieval history, complete with a castle, thrown in for good measure, as well as a story about food. Need we say more? Just off the Via Aurelia, about an hour north of Rome. Map. I MUST CONFESS, I have a weak spot for the Etruscans. 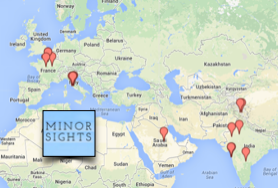 In a place like Italy, it's easy to become a little blasé. So in order to be wow-ed, something needs to be really old, or in really good condition, to stand out. The Etruscans provide this superlative. Granted, most of the stuff they left behind is not very sophisticated (like a few thousand cave tombs) but all of it is really old. Typically at least 500 years older than the Colosseum. Some Etruscan sights stand out because they show great artistry. Like the painted tombs of Tarquinia or the sarcophagi of Tuscania. But Vulci stands out because it's a whole city! (OK, bear in mind cities were a bit smaller in those days than they are now- just managing expectations). It's an Etruscan Pompeii, complete with a city wall, roads, and foundations of temples and houses. But Vulci was not obliterated by a volcano. It was obliterated by the Romans, who conquered it in 280 BC or so. The Romans added a little to the Etruscan city but, having lost its relevance, it sank in decline and then into oblivion. 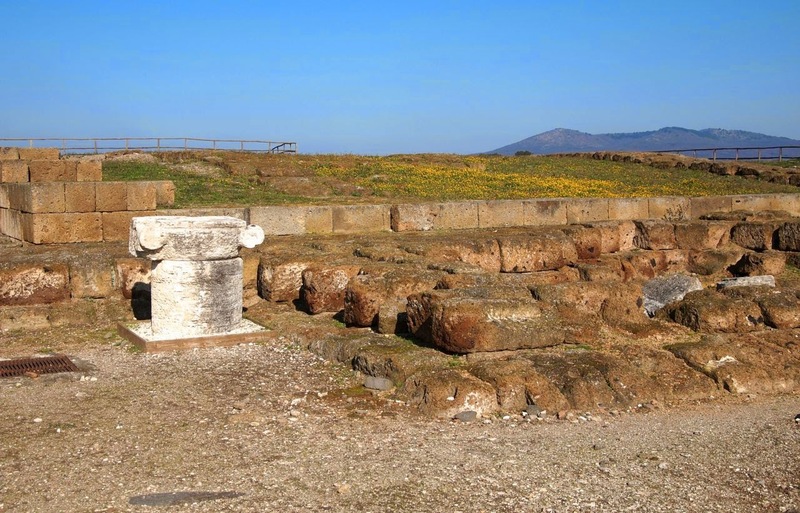 Vulci had its heyday in the 6th century BC, when it was a powerful city state, in league with several other Etruscan cities. Some of the remains date back to this date, including a painted tomb, the François Tomb (limited opening hours- do check in advance). Others are from later centuries. The Romans connected the city to their Via Aurelia, stretches of which can still be seen. But mostly, they just let it rot. 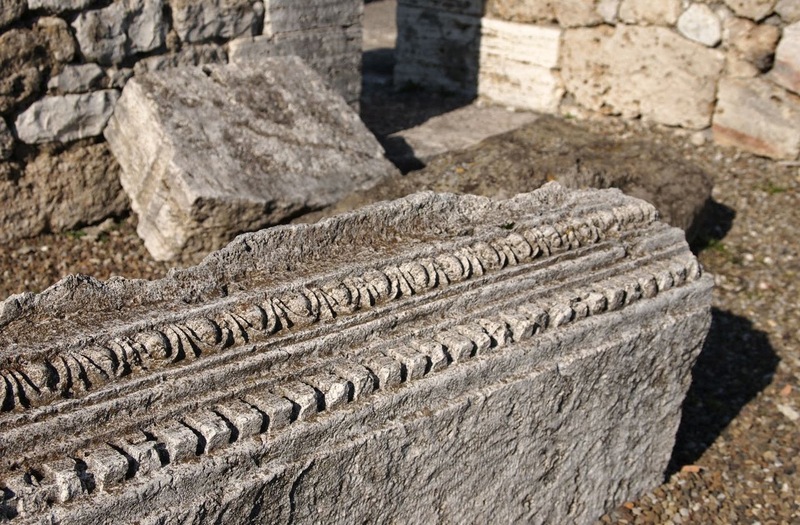 Remains of the principal Etruscan temple. Both Etruscans and Romans were keen interior decorators. Ever since Vulci was abandoned, some 2000 years ago, this area has remained mostly uninhabited. And still is. This part of Tuscany and Lazio is called the Maremma, which was a marshy area plagued by malaria well into the 20th century. 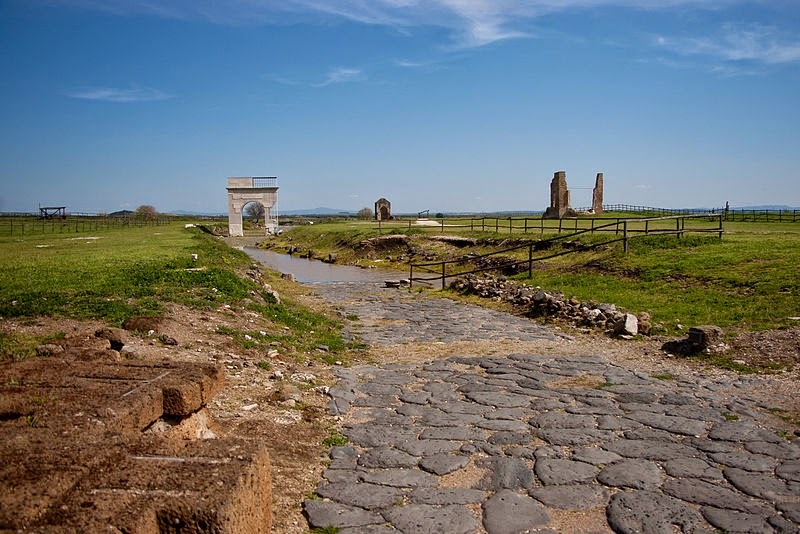 (Rest assured, the malaria is gone- no prophylaxis is required to visit Vulci). It's still a green, grassy area. 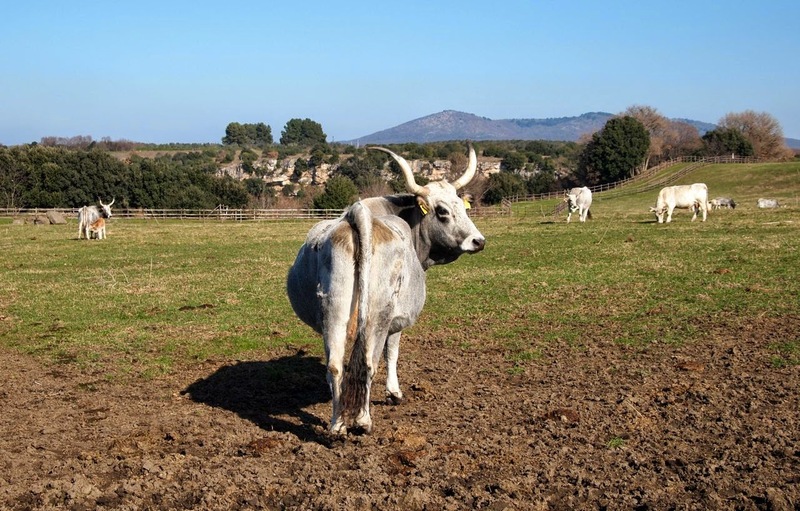 The Maremma is not just known for its Etruscan ruins, it's also well known for its cattle, known as maremmana. Maremmana look like they've just walked off an Indian movie set- although some people claim their pedigree goes back to the Etruscans themselves. Who knows? What we do know is that they provide tasty steaks... which is what they're mostly raised for these days. Think global, eat local. Maremma steak, I mean, cattle. 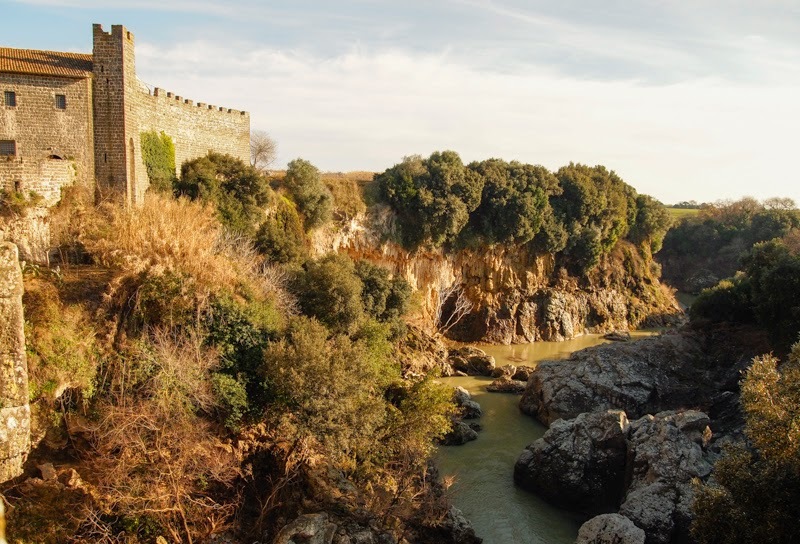 Lastly, there is the castle with its impressive bridge, spanning the deep crevice of the river Fiora. The castle is known as the Castello della Badia or Castello dell' Abadia (Italians can't seem to agree upon the spelling.) The castle is empathically not Etruscan. 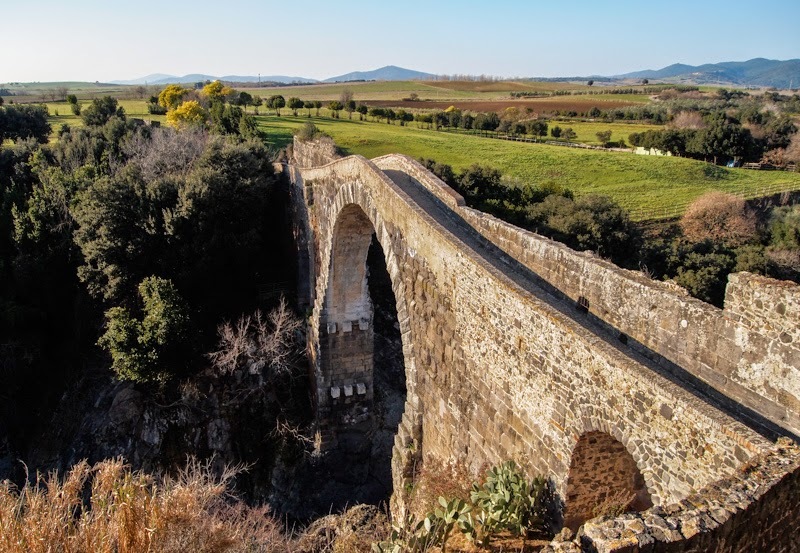 But the bridge has Etruscan foundations, built upon by the Romans, and then restored in the Middle Ages... so it's probably a bit of a stretch to call it an Etruscan bridge but it does have a pedigree. 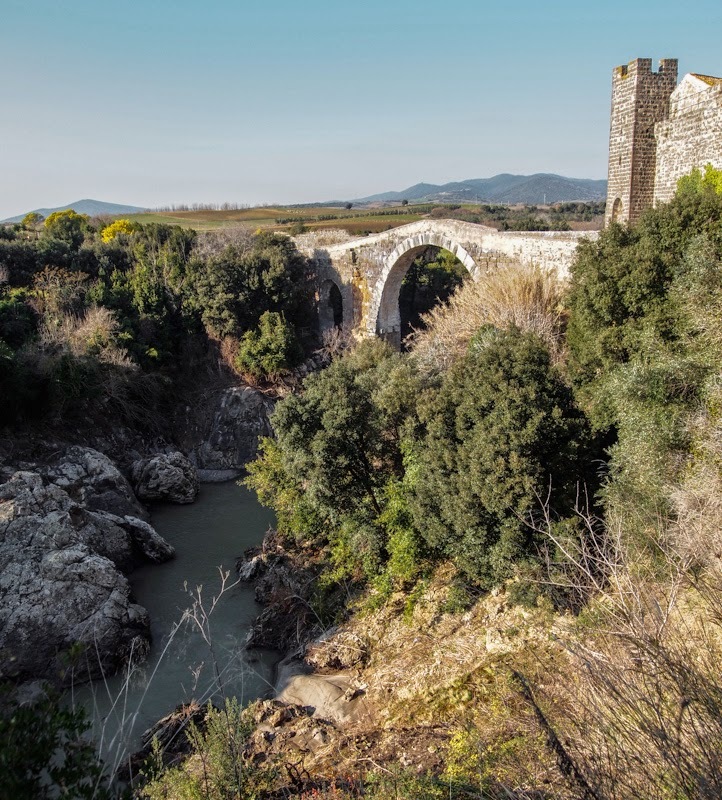 The Castello was built in the 11th century and served to protect the bridge, which was the only bridge for miles and miles. This was convenient to whomever controlled it, as that meant it was a handy moneymaker, as it could be used to squeeze a bit of money out of any innocent traveller wanting to cross. The Papal toll house, aka the Castello dell' Abadia. For a long time this was a border, toll and customs post between the Papal States and the Duchy of Tuscany. It must have turned a good profit for the Vatican (how else do you think they could afford to build St Peter's?) until alternative routes and bridges developed and the castle was abandoned. These days it houses a museum that contains some of the treasures found at Vulci (although some of the best finds have been carted off to museums in Rome, Paris and London). You do need a car. Ever since the Etruscans left, this area has been devoid of public transport. 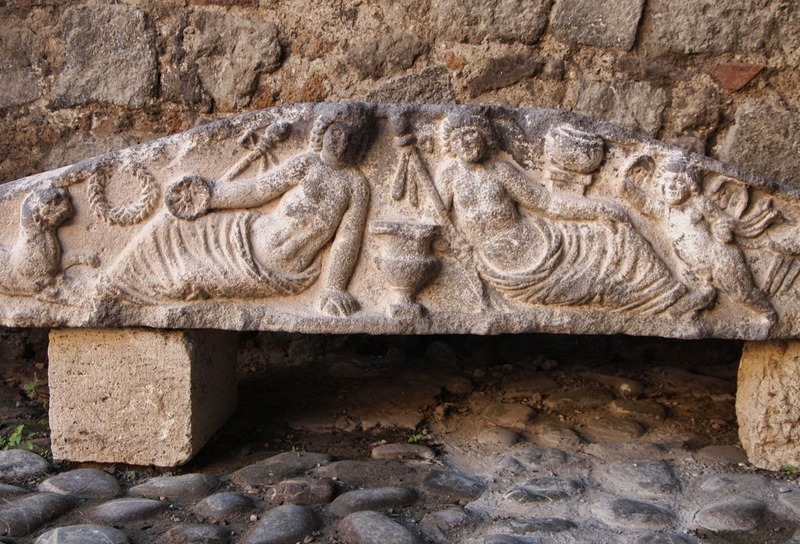 The good news is that a trip to Vulci can easily be combined with a visit to the Minor Sights of the Tarot Garden and Tuscania, or the painted Etruscan tombs at Tarquinia. If you have your own wheels, a day trip from Rome is very doable. DH Lawrence's Etruscan Places, a classic book on the region.